Car & Vehicle Locksmith Honolulu specializes in car and vehicle locks and keys. Rare in Hawaii, we can cut and program electronic transponder chip keys for your car. Locked Out? Lost Keys? We do it all. At Car & Vehicle Locksmith Honolulu, we don't just do vehicles, cars, trucks, motorcycles, and mopeds. We service all types of lock hardware, including locks for private homes, condominiums, military and commercial buildings. Car & Vehicle Locksmith Honolulu is a kama'aina family owned and operated business in Honolulu, which means you'll get great service at affordable prices. 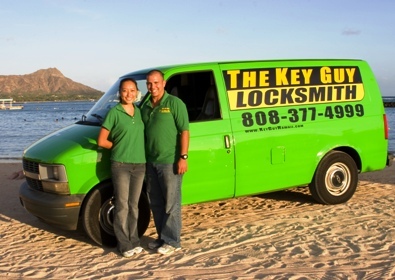 The Key Guy: Car & Vehicle Locksmith Honolulu has professional locksmiths on call at 548-1999 on Oahu. We pride ourselves on fast responses, expert advice, quality materials, and most importantly, guaranteed customer satisfaction. The Key Guy: Car & Vehicle Locksmith Honolulu and all The Key Guy affiliates are kama'aina companies located in Hawaii. Support local businesses!